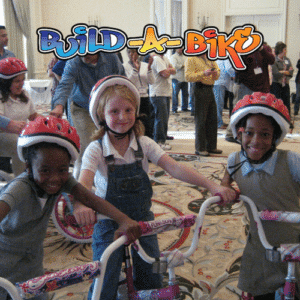 Since we created the Build-A-Bike ® team building activity in 2005, we have received thousands of requests to post the instructions for Build-A-Bike ® team building activity online. We’ve always been a little hesitant to post the instructions, because we have spent over a decade creating a brand that the public recognizes as a quality product. However, the event is so popular, that we really want to make sure that if you are doing one of these programs on your own, that you have every opportunity to make the activity successful. The absolute, most important thing to keep in mind about team building activities is, the larger the event and the longer the time frame, the more you will want a professional team building instructor or facilitator. If your group size is 20 people or smaller, and you just want a quick 30-minute fun activity, then the self-facilitated version might be excellent for you! However, if you want an event to last an hour or two, or if you have a group of 100 or more people, we strongly suggest that you higher a professional instructor. (We have a list of certified instructors located all over the US, Canada, and Europe. Just call us at 800-872-7830 for a list of instructors in your area. When we deliver a Build-A-Bike ® activity, our goal is to keep every participant active and having fun throughout the entire event. If this is your goal as well, make sure and hire an instructor. The instructors on our list have each conducted HUNDREDS of events. They have seen everything. They can handle any challenge that presents itself. The biggest challenge that we see in self-facilitated events is that there is often a few people participating and a bunch of people standing around watching. Finally, if timing is important, we suggest a professional instructor. It typically takes a single person about 15 to 20 minutes to assemble a bike. If you have groups of four to eight people working together to build the bike, it typically just takes a few minutes. So, the activities that accompany the event are way more important than the bike assembly. We offer a turn-key Build-A-Bike ® Kit that includes a bike, helmet, team building activities, and access to an online instruction manual for a small fee. You can order these kits online at Build-A-Bike ® Kit. At the time I’m writing this post, we are charging $200 per kit. We suggest at least one of these kits for every eight people in your group. Keep in mind that if you are donating the bikes to a charity, the larger the donation, the more impressive the ending of the event. So, if you only order a single kit, you’ll just have one bike at the end to donate. We also suggest that you donate at least four bikes — even if you have a small group of participants. If you want to create a custom activity for your group, for a small fee, our instructors can design one for you. You can also rent tools from us. So, we can ship you a team building event in a box fairly easily. Even if you don’t want to purchase our kits, we have posted detailed instructions about a number of our favorite team building activities. Links to these activities are below. Start with a Fun Ice Breaker Activity. Add an Activity where Participants Earn their Bicycle Parts. We suggest either the Helium Stick or Tennis Ball Exercise. Since we do thousands of these activities all over the world, we have an extensive list of charities who know about Build-A-Bike ® and will enthusiastically accept the donation.